Name Calling – it’s frustrating, it’s rude, it’s embarrassing & it’s infuriating! When our kids latch onto a rude or inappropriate word, it’s sooooooo hard to get them to stop. Rational explanations don’t work. Shouting makes it worse. And ignoring it doesn’t make the words go away. It will come as no surprise when I suggest that you CONNECT with your child through play. But what does that actually look like? And why exactly will it work? “You’re stupid”. “You’re a poo-brain”. All these things that children can say repeatedly to you, to other children, can be so infuriating. 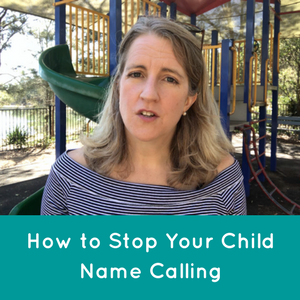 So today we’re looking at name-calling and how to help your child to stop name-calling. When your child is saying something rude or disrespectful, it can be so triggering for us, can’t it? It can bring up all this sort of feelings of anger and overwhelm and we don’t know how to stop it. But we overall get really frustrated with our child saying these things repeatedly, again and again and again. We’ve asked them expressly not to say it. We’ve explained why it’s not nice to say it, but they keep doing it and it’s SO infuriating! What you can do, as ever, is to connect with your child through this irritating behaviour. My son is three, and he currently likes to say, “You’re stupid,” and he’ll call me stupid and he’ll call other people stupid. 1. It’s helpful when our children say these words, to first of all understand that they often don’t know really what they’re saying – my son has no concept really of what stupid means – to not often take those words at face value and as seriously as we might do if a five or a ten or a twenty year old called me stupid. 2. The second thing is to recognize that often it’s code. In the case of my son, he’s calling me stupid. He would have heard this name, or this term used by another child. It could have been at him, or he could’ve heard it in general and he doesn’t know what it is, but he seen that there’s a reaction to it. If he’d been called it himself, he doesn’t know what it is but he knows he feels yucky. By him exploring this word with me in the safety of his family, that means he’s trying to figure it out. It’s not a simple word like calling somebody a tree. That doesn’t have a reaction, but calling somebody stupid does. He knows that, and he’s trying to figure out an understanding of what that all is and playing with it himself. When your child is using a word that you don’t like, it could be a swear word, it could be stupid, it could be bum – anything that gets a reaction from them. Notice that they are playing it out and that they might’ve experienced being called that themselves. That can lead to a bit of hurt – when people are hurt they express themselves often in unpleasant ways, but they’re trying to understand what happened to them. Don’t swoop down harshly on them. Recognize that they’ve either heard it as a negative thing against themselves, or they might have heard you dropping that word in conversation and they’ve used it in exact context. 3. Also, it’s code often for upset feelings. My son now uses it when he gets really hurt, upset, frustrated or annoyed. If I say, “No, you can’t watch another TV program.” Then he goes, “You’re stupid.” Because that’s his way of expressing his anger, his frustration and he’s lashing out at me. Recognize that there’s big feelings behind the use of that word. OK, what do you do?! The first thing, as with everything that I offer, is to connect with your child through the behaviour that they are displaying. In this case, we’ll use the example of George saying I’m stupid. I might then playfully connect with him through it, because connection leads to change. When we’re being harsh and disciplining, we’re not addressing the reasons why they’re saying that word, then that word might perpetuate or just then transfer to another annoying behaviour or another word. Connect with your child and play is an awesome way of connection. So if my son’s saying “you’re stupid”, I might go, “You’re a flower head.” Because what we’re trying to do is transfer that charge around that word on to more benign words and it dissipates it. He’ll then call me a flower head and I go, “You’re a shopping trolley. Or you’re a tree.” Or something like that, and we just playfully trade insults at each other. Laughter is a great stress release. It’s connecting, which brings us together, which means that he’s far more likely to listen to my request for him to not use it in the future. Another one is I often will playfully respond, “Well you’re stupid.” “No, you’re stupid.” Or I’ll go, “Well daddy is stupid.” “The car’s stupid”, or “the kangaroo is stupid.” Or whatever it is. Again, it removes that charge from that word. You’re playing with the words. Recognize they’re little, they’re figuring things out and they’re playing with them. The more that you connect with your child in this way, the more likely they are to then listen to you when then do set limits. This is not about saying “yeah, call me stupid it’s all fun” because there’s times when it’s deeply inappropriate to call you stupid. When you connect with your child, then at another time while you’re still feeling that sense of connection, then you go, “Sweetie, not here, not now.” They’re far more likely to listen to you then. The times that I haven’t been connected with my son and he’s called me stupid, and I get more, and more, and more irate with him, he says it more, and more, and more times because the connection isn’t there. I’m getting crosser with him and more frustrated with him, so his hurt is growing. He’s going to use it even more and more. Then we’ve gone in to that vicious cycle of going, “George, don’t say that.” “You’re stupid.” “Don’t say that.” It just escalates. So play transforms these difficult situations. I know some people can get triggered by the word stupid, because perhaps they were called stupid when they were younger so that’s got a particular charge for them and they find it even harder to connect when you know, that word is being used at them by a two or three year old. Notice your feelings too, because your feelings count. don’t take it as face value, they often don’t know the meaning of the words. They’re often trying to figure out why somebody has perhaps used that to them, and they’re playing with that word and figuring it out. and then at other times bring that loving limit, which is gentle and they’ll be far more likely to respond to you because you connected with them in the first place. I hope that helps and I’ll see you in the next video!